Nigeria will either wrap up her quest for a ticket to next year’s FIFA World Cup in Russia today or allow Cameroon delay what looks like an inevitability. 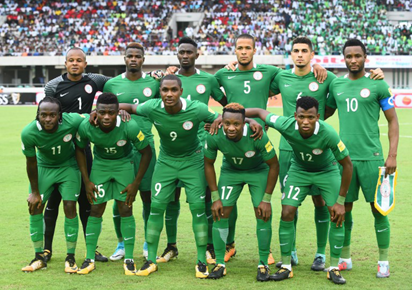 The Super Eagles 4-0 victory over the Cameroon Lions in Uyo Friday was, according to Odion Ighalo, Eagles’ first goal scorer in that match, “a significant step” towards securing the ticket. Today’s match therefore has a lot of meaning to the Eagles than their hosts who have no chance of dreaming Russia any longer. With Zambia taking over the second spot in Group B, after their 3-1 victory over Algeria on Saturday, Cameroon’s chances have further been dampened. Cameroon coach, Hugo Broos who guided the team to AFCON glory early this year, has since thrown in the towel. He told the world in Uyo that today’s match in Yaounde hold little, if any, significance to Cameroon. “We have no chance,” Broos admitted after the Uyo debacle, saying the Eagles were clear favourites. But his Nigerian counterpart, Gernot Rohr sees things differently. “We are not yet there(in Russia). We must be humble because there is still a lot to play for,” he cautioned. The post Eagles in Lion’s den appeared first on Vanguard News.